For owners of rental or commercial real estate, forming an LLC (Limited Liability Company) is a common tactic used to transfer title to the property from the individual owner to the LLC. 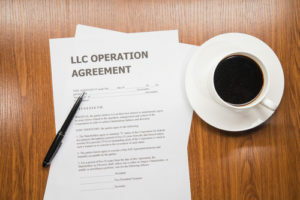 Transferring property to an LLC can limit your personal liability if someone is injured on the property and files a lawsuit against the property owner. Front Door Title can help you in forming a real estate LLC to transfer property title, create a new deed, etc. We can make sure you have the right forms, that they are filled out correctly, and that they are processed as required. We work with companies and individuals in Harford County and Baltimore County. Below, we’ve compiled some of the steps involved with transferring property title to an LLC. If you have a mortgage on the property, contact your lender. Transferring a real estate title to an LLC doesn’t transfer the mortgage. You personally are still responsible for making the mortgage payments on time. In addition, many mortgages have a “due on sale” clause, which means that if you transfer ownership of the property, the lender could require you to pay the full mortgage amount. Your lender may be willing to allow you to transfer property title to an LLC that you own, as long as you remain fully obligated on the mortgage. Your lender may also require you to refinance the mortgage with the LLC as the borrower. Unless your LLC has an established income and credit history, you will also have to sign a personal guarantee that you will pay the mortgage if the LLC cannot. Finally, the lender could enforce the due on sale clause, requiring you to pay off the mortgage and seek new financing. You should make sure you understand your lender’s requirements before you try to transfer title. Form an LLC, if you haven’t already. You form an LLC by filing articles of organization with the agency that takes care of business filings in your state. You can form an LLC online or in person. In Maryland, you form an LLC through the Department of Assessments and Taxation, using the Articles of Organization form. Obtain a Tax ID number and open an LLC bank account. If your new LLC has more than one owner, has employees, or meets certain other requirements, you are required to get a Federal Tax ID Number (also called an EIN or Employer Identification Number). You can do this yourself by filling out a form on the Internal Revenue Service website. Even if it’s not required, you may need a tax ID to open an LLC bank account. Once you have a tax ID number, you can go to a bank and open an account in the LLC’s name. A separate bank account helps keep your LLC money separate from your personal finances. If you don’t maintain this financial separation, you risk losing the liability protection that your LLC provides. You can find a deed form at your county recorder’s office or on the Internet, or you can have an attorney prepare a deed for you. In general, since a deed is a legal document, we recommend working with a professional. Front Door Title can help you with a new deed. There are two kinds of deeds: warranty deeds and quitclaim deeds. When you purchased your property, you most likely received a warranty deed that included a guarantee that the title was good and free of any claims or interests by third parties. A warranty deed passes that guarantee on to your LLC. If you transfer title through a quitclaim deed, you are simply saying that you are passing any interest you might have in the property to your LLC. The quitclaim deed doesn’t guarantee that the title is good, or even that you own the property, so we don’t recommend them. Because of the protection they provide, warranty deeds are typically used to transfer property between unrelated parties. Experts disagree on whether you should use a quitclaim or a warranty deed to transfer a real estate title to your LLC. Many people use quitclaim deeds, but Front Door Title recommends using a warranty deed because it gives the LLC some remedy if there is a title problem and it preserves the chain of title to the property. Fill out the deed form. You are the grantor and the LLC is the grantee. Make sure you specify your name as it is written on your current deed, and use the full legal name of your LLC. You may be asked to specify the purchase price, or “consideration” paid for the property. If there’s no money being exchanged, you should consult your county recorder or state laws to find out the minimum consideration required for the deed to be valid. Again, Front Door Title can offer assistance with this process. Sign the deed to transfer property to the LLC. As grantor, you will need to sign the deed, and Maryland requires that you sign in front of a notary public. Recording the deed creates a public record of the property transfer. You record a deed by submitting it to the registrar or other agency that handles real estate records in your county or city. Front Door Title does this as part of our title services. If you’ve transferred property that you rent out to others, you should amend any leases to reflect that the landlord is now the LLC, not you personally. Rent should be paid to the LLC and deposited into a separate LLC bank account. Following these formalities will reduce the likelihood that you could be held personally liable if something goes wrong. Transferring property to an LLC is a simple way to reduce your personal liability for claims relating to the property. But a property title transfer is only part of your strategy. It’s also important to contact an insurance agent and make sure you have adequate liability insurance to cover any claims that might arise.